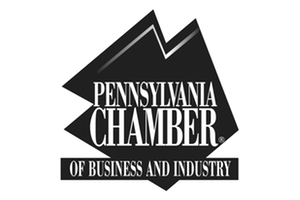 The Pennsylvania Chamber of Business and Industry was founded on Dec. 16, 1916 by a group of more than 100 influential business leaders from 35 Pennsylvania cities representing 50 local chambers of commerce, boards of trade and similar organizations who recognized the need for a unified voice for business in the halls of the state Capitol. Headquartered in Harrisburg, and with offices in Pittsburgh and Allentown, today’s PA Chamber is the largest broad-based business association in Pennsylvania. Our membership comprises thousands of member businesses of all sizes and industry sectors throughout the state—from sole proprietors to Fortune 100 companies—representing nearly 50 percent of the private workforce in the Commonwealth. The Pennsylvania Chamber is not affiliated with any political party and is not part of government. Our mission is to act as “The Statewide Voice of Business™” and articulate and advocate on those public policy issues that will expand private sector job creation and lead to a more prosperous Pennsylvania for all its citizens. Business advocacy is at the heart of the PA Chamber’s work. With a full-time staff of experienced business lobbyists, an active political action committee, legislative issue work groups and grassroots action network, the PA Chamber serves as the frontline advocate for business in the state Capitol. The Pennsylvania Chamber is dedicated to helping its members understand and easily follow the complexities of state and federal workplace regulations. Educational services include conferences and guidebooks on a wide variety of issues important to the business community.